Check out knitnscribble's knitting and crochet Facebook page for knit and crochet pattern highlights, oddities, and freebies. 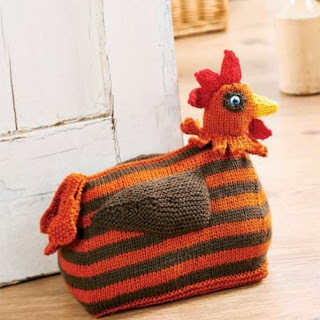 You'll find goodies like this chicken doorstop free pattern link. Ann Budd gets rave reviews! Fancy Lace Sweater at 2 years old! Now in two long-lasting sizes! Quilts in America - #1 NEW release! FIVE STARs and Brand NEW! PAID ENDORSEMENT DISCLOSURE: In order to support this web site, small monetary compensation or other types of remuneration for endorsement, recommendation, testimonial and/or link to any products or services from this blog may be received. Knitnscribble.com, 2019. Simple theme. Theme images by gaffera. Powered by Blogger.